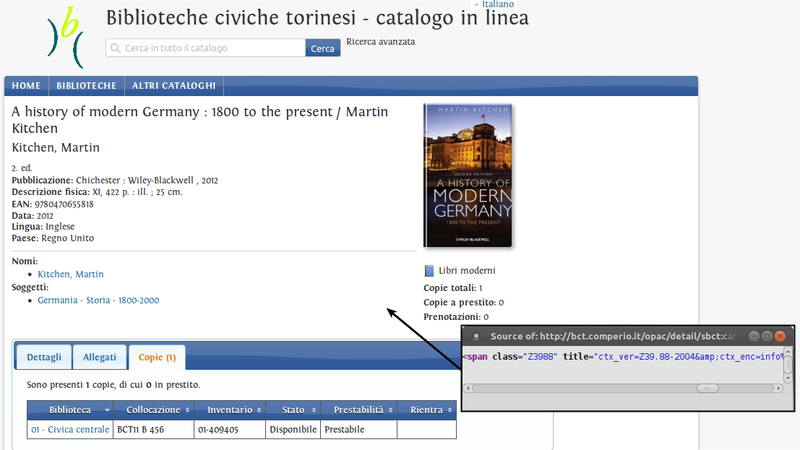 Quello che vedete qui sopra è una possibile implementazione dell’OpenURL COinS che prevede appunto di concatenare all’interno dell’attributo title del tag html <span> le informazioni bibliografiche di un libro. Siccome si tratta di un tag generico che di per sè non rappresenta nulla, è molto comodo poterlo usare in questo modo. 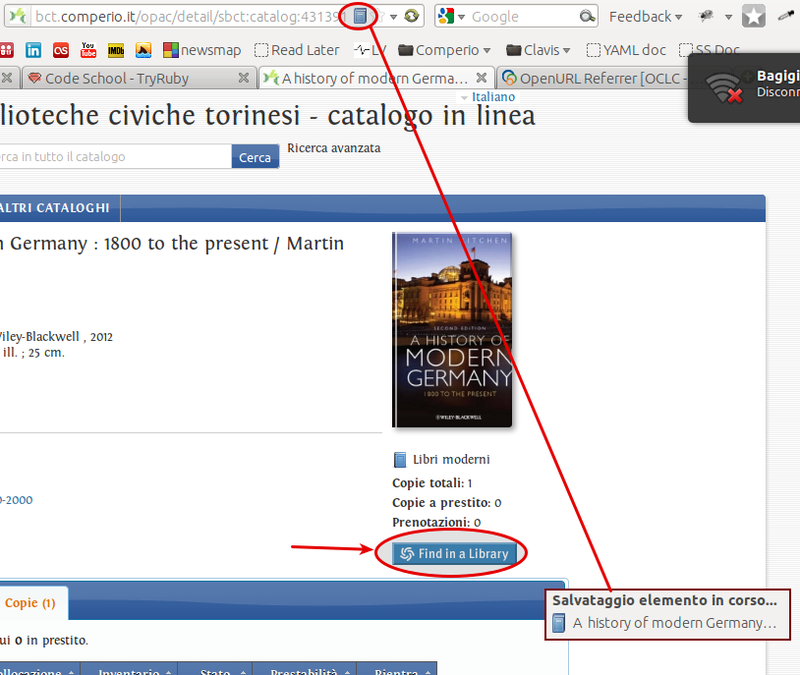 Magari ogni giorno navigate su OPAC o altri siti che contengono informazioni bibliografiche, e disseminati nel codice ci sono questi tag. Per vedere in azione i possibili usi della cosa, potreste installare alcune estensioni in grado di interpretarli ed usarli a dovere. Ad esempio ecco cosa succede se attivate Zotero oppure il plugin OpenURL Referrer di OCLC. WOW!!! Posso salvare la risorsa nella mia bibliografia con un clic oppure lanciare al volo una ricerca su WorldCat!!! Back from the summer, back to work. Well…indeed I’ve worked all the time…by the way, sorry for the late late late late post. Cpd23 is near the end and my reflection are still on 22 august…. After a year or so, finally I’ll have to produce scholarly articles and the second point will become “all-my-work-is-a-matter-of-organization”….so I hope to improve my use of those tools, at least to suggest them to people that really need. I think the better tool for manage bibliographic reference is Mendeley, because rather than Zotero or citeulike has a client not tied to a browser. So, if you have a bunch of documents that you need to reorganize, you should use Mendeley (my case…). I never used citeulike, but Zotero has always been tied to my browser. It’s funny because I use it to review websites rather than to save references. Like other firefox addons (for example DublinCore viewer), it show me if the site take care about metadata.